They say that the best way to get to know the Emerald Coast is from the water, and nowhere is that truer than in Fort Walton Beach. 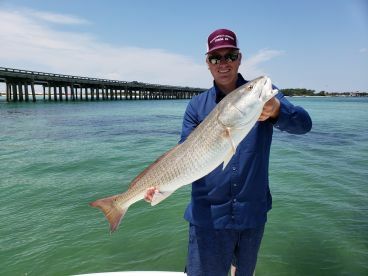 Fort Walton Beach fishing charters can take you to some of the most beautiful and iconic spots in the bay, or see you fishing 100 miles out in the heart of the Gulf of Mexico. You’ll be fishing with lifelong guides whose families have worked these waters for generations. And to top it all off, you’ll be enjoying some of the best fishing grounds in the country! 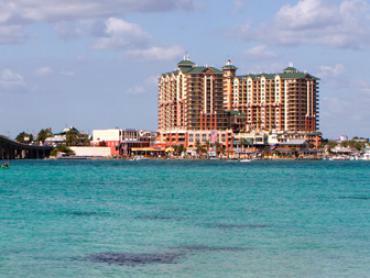 And there’s more to the town than just fishing, unlike some famous spots on the Emerald Coast. 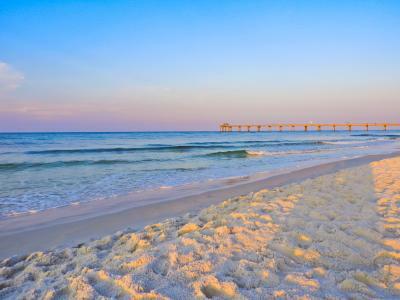 From fun family days at the Gulfarium Marine Adventure Park to romantic evening strolls along the town white sandy beaches, Fort Walton Beach makes for the perfect getaway location. With so much going on, you can easily distract the family long enough to jump aboard one of the many awesome charter boats in town! Fort Walton Beach fishing is amazing in any depth of water. 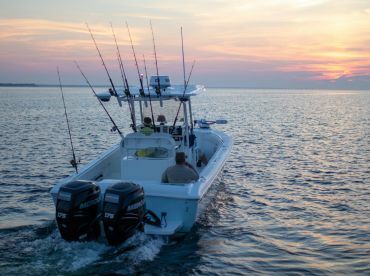 There’s a boat for every habitat and an experienced guide to match, so the hardest part can be choosing where to fish. Where you go is ultimately decided by what you want to target, so here are some of our favorite fishing spots for the area’s top species. If you’re looking for awesome bay fishing, look no further than Fort Walton Beach’s Choctawhatchee Bay. With over 100 square miles of sandbars, grass flats, and river mouths, there’s plenty of space even in the busy winter months. The constant supply of rich, fresh water feeds huge populations of Menhaden and Bay Anchovy. These are then gobbled up by big Striped Bass, monster Bull Redfish, and ferocious Gator Trout. The best part? It’s well within kayaking reach, even for amateurs! 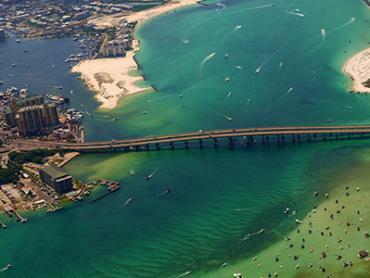 Head out past Okaloosa Island’s East Pass and into open waters and you’re surrounded by reefs and wrecks. Spots like the 360’ “Liberty Ship” draw food fishers and sport anglers alike and can easily support several boats. 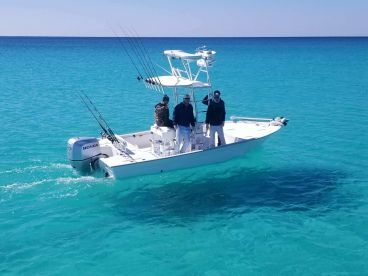 It’s easy to see why they’re so popular, with Cobia, Spanish and King Mackerel, Amberjack, Blue Runners, and smaller Snappers and Groupers swarming these shallow structures. If the local reefs don’t quite cut it for you, you won’t need to head too far to find bigger fish. This section of continental shelf is under 30 miles from town. Expect King Mackerel, Mahi Mahi, and Blackfin Tuna, as well as big Red Snapper to fill your freezer with. During the summer months, Wahoo and even Sailfish can also be caught here. Who said you have to travel far to find big fish in the Gulf? Of course, if you’re up for the long journey, you’ll be well rewarded. 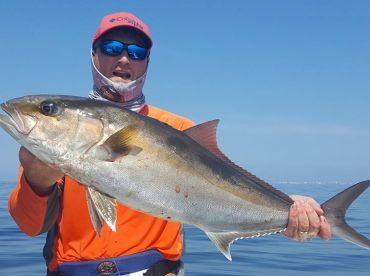 The best Deep Sea Fishing Fort Walton Beach has to offer takes several hours to get to, out at remote oil rigs and famous spots like the De Soto Canyon. Blue and White Marlin can both be caught here, as can Swordfish, Sailfish, and huge deep-water Snappers. The signature species, though, is Yellowfin Tuna. Tuna chunking has to be some of the most exciting angling around, with boiling waters, hard hits, and constant action. This is big game fishing on steroids! You can spend the morning battling Redfish and Trout for under $500 aboard many of the smaller bay boats in town. Fish the local reefs on a decent center console, and it won’t cost you much more. A half day on a 30’ flybridge will normally cost somewhere in the $800 range, and normally won’t be over $1000. Head offshore and things start getting a lot more expensive. 8-hour trips start at $1500 and 12-hour, 16-hour and overnight trips are all common. A 16-hour deep sea trip may cost well over $3000, but you’ll be traveling well more than a hundred miles round trip and will be targeting some of the biggest fish in the sea. Live bait dominates the Fort Walton Beach inshore fishing scene. This isn’t really surprising when the whole bay is full of Menhaden and Minnows. A decent stock of live bait and a sturdy spinning rod will give you hours of fun against big tailing Reds. If lures are more your style, throw some spoons into the grass or comb the edge of the oyster bars casting jigs to tempt in monster Trout. Head offshore, and you’ll spend most of your time trolling. Fort Walton Beach Guides normally use artificial baits because of the long distance they cover. Moldcraft soft plastics are the most common trolling lures, although bridled live Tuna is also a common sight when going after billfish around FADs and rigs. When chunking for Tuna, you can either bulk up with 80-pound stand-up gear or can keep things wild and loose with heavy-duty spinning tackle. You don’t need a fishing license aboard registered Fort Walton Beach fishing charters. Bait is usually included and you can find fly fishing specialists which stock quality equipment is that’s more your style. All you really need to bring is some sunscreen, a quality pair of shades, and whatever food and drink you want for the day. If you’re heading offshore for the first time, you should definitely consider seasickness tablets to make sure you actually enjoy your trip. Kick off the new year with some awesome sight casting out on the grassy flats of the Choctawhatchee Bay. 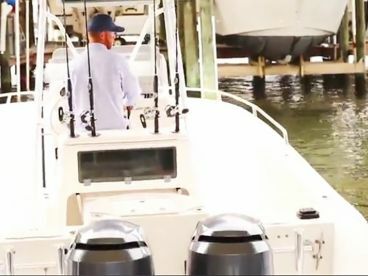 This is one of the most exciting types of fishing in Fort Walton Beach, with huge numbers of hungry Trout and Redfish. With dry weather, cool temperatures, and low winds - February is the perfect time for great flats fishing. On the reefs, Snapper and Grouper are gobbling up baits, with plenty of Amberjack around for some extra fight. Red and Black Drum, Trout, Flounder, Sheepshead - March is a great time for inshore fishing in Fort Walton. Offshore, big numbers of King Mackerel start showing up, making for awesome battles and some tasty eating. The fishing just gets better and better as the year rolls on, especially out in the Gulf. 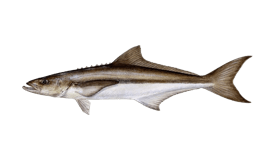 The Cobia migration come barreling into town in April, and Triggerfish join the permanent residents on the reefs. Jack Crevalle arrive in the shallows, joining the Redfish and Trout to make the bay a fly angler's dream. The offshore action is in full swing, too, with Yellowfin and Blackfin Tuna, Wahoo, Mahi Mahi, and even a few early Blue Marlin! The shallows and the blue waters are both on fire in June, but the place to be is on the reefs. Red Snapper season here, and Gag Grouper are fair game, too. 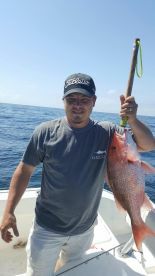 Book a specialty Snapper trip and you're guaranteed to fill the freezer! 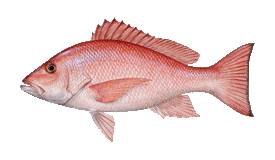 Red Snapper season is still in full swing, so head out and bag your limit! Just here for the sport? Tarpon are in town, offering the ultimate shallow-water battle. Still not happy? Luckily for you it's peak Blue Marlin season! August is one of the hottest, rainiest months of the year in Florida, there's no way to sugarcoat that. Brave the heat and the humidity and you're well rewarded, with Marlin, Sailfish, Wahoo, Tuna and so much more. 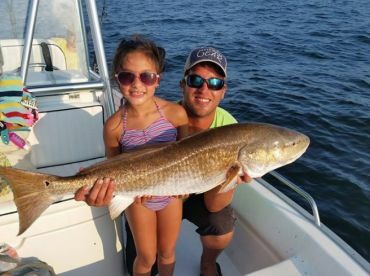 The Annual Breakwater Outfitters' Battle on the Bayou is your chance to prove your skills against huge Redfish and Trout (not to mention other experienced anglers). This is one of Fort Walton Beach's most important tournaments. Destin's Fishing Rodeo needs no introduction. This free tournament draws one of the largest crowds of any angling event in America, offering great fun and big prizes. A word of warning: you need to book early if you want to find a room. Forget the turkey, November is Grouper season in Fort Walton Beach. Red, Gag, and Scamp Grouper are all around this time of year. 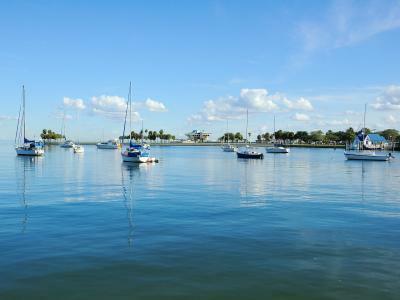 Throw in average temperatures of 60 degrees, and you've got the perfect Thanksgiving destination! The deep sea action may have cooled off with the falling temperatures, but the inshore battles are still going strong. Redfish, Trout, and Flounder and always on hand for a fight. Happy holidays indeed! A four hour trip would be preferred. Eight hours is a commitment to fishing. "Half a day trip with Captain Smith"